After you select your new pet from the list below, please contact us immediately! Pit mix, around 7 years old, has been with dogs and cats with no issues. Walks well on a leash and has very nice manners. Sally is a 2 year old, 45Ib, shepherd/ border collie mix. Born in a shelter, Sally spent her first 10 months knowing only shelter life. This would typically cause some personality flaws for most dogs, but not Sally! Happy-go-lucky, vibrant, and loving are just a few of the words we would use to describe Sally's personality. She lives for being with other dogs and people. Sally is a young lady that enjoys keeping her mind busy and running with the pack whether they are big or small. After spending her day out and about, Sally loves to end her day snuggling with anyone that will let her lay on them. 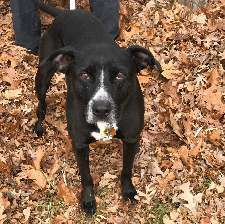 Sally will need a fenced in yard to run, play, and enjoy everyday!